Some people can handle a huge mess in their art room. Tim is not one of those people, but Abby Schukei is. They get together for this episode to discuss the amazing feeling when kids are excited to clean and you can actually see it happening (5:45), how they feel about “paintbrush graveyards” (10:45), and how much cleaning responsibility we need to give our kids (15:30). Full episode transcript below. How Much of a Mess Do You Tolerate? Welcome to Art Ed Radio, the podcast for art teachers. This show is produced by The Art of Education, and I’m your host, Tim Bogatz. I want you to take a second, and think about the messiest most disorganized art room you can think of. And close your eyes, and picture it. Maybe don’t close your eyes if you listen to this on your commute. You know what I’m talking about. It is just a mess, and some people do well in that situation. I definitely do not, and I think most people do not. 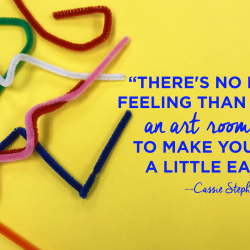 We need to talk about how to keep your art room a little bit cleaner, or a little bit more organized, or at the very least keep it from getting trashed. And let me ask you this, do you know an art teacher who has a room that appears to be a total disaster, but somehow they always seem to know where everything is? All right, for me that is my friend, Abby Schukei, and also Andrew McCormick, come to think of it. How am I always drawn to, talking to, and hanging out with the messiest art teachers around? But, I’ll digress. This episode is actually inspired by Abby, and she’s going to be my guest today. I was in her room not too long ago, and I was fascinated about how she was just at home in an art room that I could not handle on a daily basis. We talked about how we’re at our best in totally different situations. And no matter the difference in what you like in your room, you can’t allow it to ever get completely trashed. And we decided the conversation might make for a good podcast episode, so, here we are. And she was kind enough to let me film some videos in her room, and kind enough to give me some of her time coming on this show now. And of course I’m repaying her by telling the world how disorganized her classroom is. And I don’t think I’ll get inside her head about why she does so well with a messy room, but I do think she’ll have some good tips on how to keep things from getting too bad, and maybe even the best way to keep things organized. You know, if you’re inclined to do that sort of thing. And I think we need to have that conversation because teaching art involves just so much stuff. Like, so much physical stuff. And because of that there are going to be times when the art room is just a disaster. And no matter your organization style, there are just times when it gets ugly in the art room. And we’re gonna chat about how to keep that from happening. How to keep it from happening too often. And how to keep it from getting too bad when it does occur. You know, sometimes it’s the kids. Sometimes it’s the teacher. Sometimes the custodian that makes things a mess. Usually the kids. All right. 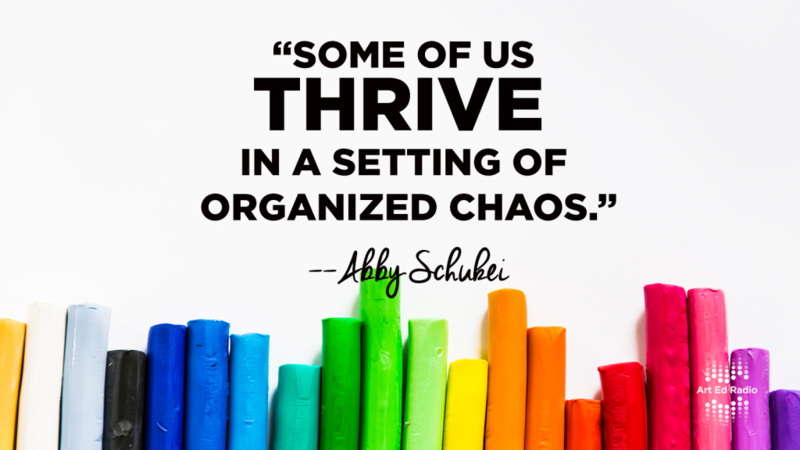 But some art teachers are at their best in that disorganized situation, but I think most are not, and that’s why today, Abby and I are gonna talk about how we can get our kids and ourselves to quit trashing the art room. All right, I am here with, Abby Schukei. Abby, how are you doing tonight? Abby: I’m doing pretty good. How are you? Tim: I am doing really well. We have a lot to discuss about terrible disgusting art rooms. Of which yours is one. Tim: Just to let everybody know, I recorded some Art Ed PRO videos in Abby’s classroom last weekend, and I get the distinct feeling that her custodian hates her. Abby, first question, how does your custodian feel about you, and your art room? Abby: Well, before I answer that question, I would just like the record to show that some of us live in, we thrive in a setting of organized chaos, which is what I do. Okay? Just the way my mind works, and we’ll get into that later, but to answer your question. The custodian question is actually a pretty awkward question ’cause I’m just going through a custodian transition. My main guy, he did everything for me, he was a rockstar, recently left. I’ve got a new custodian, and I’m trying to win her heart, but I just quite haven’t got there yet. But I will tell you that I don’t think with the custodian thing. For some reason my students have this philosophy that it’s their job to … That it’s the custodians job to clean up their mess. We’re trying to get through that a little bit. I don’t know, papers on the floor. They just are kind of lazy when they don’t go and pick those things up. I’m really trying to get into the good graces of my custodian here. I’m working towards it, so I can’t really answer that right now. Tim: Okay. Fair enough. Fair enough. And I will say teenagers are self-centered, and it’s really tough to get them to … Yeah, realize that sometimes they need to take responsibility for their mess, and for everything that’s going on in the room, everything that’s theirs. Lemme ask you though, as your room starts to get a little bit messy, all right, how do you feel about that? And then are you the type of teacher that needs to have things cleaned every single day? Or do you wait until it gets out of hand, and then just go crazy with a cleaning day? Or are you kind of somewhere in between? Abby: Definitely somewhere in between. There’s obviously some things that absolutely need to be done every day. Kids need to pick up the floor. They need to wash out their paintbrushes. They need to … If we’re doing, I’m envisioning my counter right now, and we’re working on a painting project. There is tons of paint out and things like that, and the counter is full, but that’s okay because I’m not going to put everything away every day because we’re using it. Here in a few days, when we’re all done with that, we will do kind of a deep clean of everything. You know, you do little cleanings as you go. And then kind of deep scrub, deep clean, kind of at the end. And I definitely take an entire day to do that when we are done with clay. And I think it’s because the art room is, well, maybe, just my art room it’s so dirty sometimes that you can visually see it getting clean. And I’m always shocked when kids are like that, but, you know? Tim: Yeah, I don’t know why they get so excited to do that, but I know there are some people, they just have the personality where they think better, and they work better if things are clean. And so there’s this stress level that builds up every day that they’re in this messy room, this chaotic room. Abby: Are you one of those people? Tim: No, I’m not. I’m not. I can handle a little mess, but then when things just get really clean, it’s just this catharsis for them, they’re just like exhale, and it’s so much more relaxing for them. Abby: Yeah, I don’t know what that would feel like. Tim: Now, I want to ask you though, you talked a little bit about kids getting excited about that. But it’s really tough to do on a daily basis, so, I want to, I guess, ask about motivations. Do you give kids a reward for doing cleanup well? Or some other kind of incentive? Or is it more of just a basic expectation that you need to clean this, this, and this, before you go every day? Abby: Well, it’s certainly a basic expectation, but we all know that our students don’t always follow our expectations. That is one thing, like, at the end of class, if it’s whether put your stools up on the table, or whatever they need to do, and they’re not doing it. Then you might need to do something to incentivize it a little bit. I don’t necessarily reward them because it’s something. They should clean up their own mess. But it might be something where you are all gonna stay after. You will not leave this room after the bell rings until everything is put away. Pick three things up off the floor. Even in middle school, I still have kids come up to me and show me here are my three things. I’m, like, “Okay, cool,” but you kind of do have to do that. The only time I really reward kids is if something really needs to be clean, and it’s usually actually not my classroom students, like my homeroom students or something like that. I’ll give them our school PBIS card. That’s, you know, they can cash it in for some things. I’ll be, like, “I’ll give you three of these if you do this job.” They usually do it, but other than that, it really does need to be. It’s an expectation of my students to do that. It’s their mess. Their responsibility to do that. Tim: Yeah, and I’m the same way, where just on a daily basis you need to have kids keeping things clean before it does get out of hand, but then those deep cleaning days, that’s when I bring incentives in. Where I’ll have two lists on the board of, one is here’s what has to be done. These are the required things just to get the room clean, and then I usually have the second list. Where if you want some candy, do these things. You know? And they’ll be the really gross jobs. Like, scraping the bottom of the sink. Or cleaning the counter tops, all the dried paint. Just those really difficult jobs that nobody wants to do. And so, yeah, I’ll trade in a handful of candy for those little jobs. Tim: It really is. If I don’t have to stay after school to clean stuff. If I don’t want to get my custodian angry at me. That’s worth a couple Snickers, and a small pack of Skittles. Tim: Okay, so, just kind of moving on. Just bringing attention to the mess that’s there, and kid’s responsibilities. You see all these super cutesy things. You have the paintbrush graveyard, and people hold funerals for their markers, and things like that. Do you think that brings the right type of attention to the issue of cleanup? Or do you think that kind of stuff is really received as more silly, and kind of keeps kids from thinking that it’s a big deal? Abby: I think it does kind of keep kids away from thinking it’s a big deal because it is funny. Maybe theirs gets to be added to the graveyard, or what not. I mean, I’m sure it can be effective if you’re putting in classroom. You know, your expectations in your management of the classroom, if there’s maybe a consequence for when that does happen. I know one of the things that I do in my classroom, and it always seems to be paintbrushes. A kid forgets to clean out a paintbrush. I do not leave paintbrushes out anymore. I actually assign them to my students, where they’ll get like three different ones. Maybe a big, small, medium one. Kind of just depending on what they need. If they want a different one they can trade it in, but they store those in their art bins the entire semester. If they lose it. If they don’t forget to wash it. Or if they forget to wash it out. They’re out of luck. The graveyard is probably them because I’m not going to give them another one. And I’ve really seen a difference in kids taking care of paintbrushes that way. I used to at the end of class, “Wash them out. Wash them out,” and now I don’t have to do that anymore. Because kids are, like, “Okay, this is all that I need to do.” My favorite is when you pull open a bin of a kid that didn’t wash it out. And the next day, I’m, like, “Huh, where did you get that brush from?” Or you know something like that. They can take others brushes sometimes, but … I mean, that’s a good way, I think to, if you don’t want to have to deal with all of that stuff. Put more responsibility in for your students that way. Tim: Yeah, I’m a huge proponent of that. And I actually started that one year when I didn’t have any budget money, and I realize, guys, there is no way I’m gonna be able to order any more brushes. This is what we have for the whole year. And so, I’m, like, “You get two. You get two. You get two,” and then I started to realize, oh, hey, this really works. And It is, it’s a great strategy. You’ve mentioned a couple times, kind of getting kids involved. How do you think you can get them more involved in cleanup? How can you keep them from trashing the art room? Is it a matter of, “Hey, pick up your three things?” Or does it go beyond that? Abby: It certainly does go beyond that for me. I hate it. I have tons of cupboards in my classroom, and I have them separated out by periods. Like, who is in what, that’s where they store their things. And I know when the first period class left their cupboard open because they’re the only ones that were in there. And it’s just simple things like that. Like, shut the door. There will be some sort of consequence the next day when they come in. It’s usually a cleaning consequence that’s not so fantastic. It’s, like, “Okay, we’re gonna take the first five minutes to get this task done.” We do something like that. I also have some fun things set up in my classroom. I have a basketball hoop above my trashcan ’cause students throw paper towels into the trashcan all the time, because they’re too lazy to get up. I mean, I’m too lazy to get up sometimes. You know, if it’s over there. Tim: True. Let’s be honest. Abby: And it’s, like, “Uh,” and then you miss. And you’re, like, “No,” but in my classroom if you do miss. And there’s actually a video on AOE that kind of shows that a little bit. And so we can maybe link that in here, but there is a consequence for students. It’s an immediate job, or maybe they have to sweep the floor, or wash out the sinks. They have to do something, and it’s usually pretty effective because all of their classmates rat them out the second that somebody misses. It’s kind of a big deal. It’s kind of a fun way to get them involved, but then after a while it’s not so fun anymore, and they stop shooting those paper towels into the trashcans. Tim: Yeah. I love that idea, by the way, but then just kind of moving beyond that, beyond those kind of fun and games sort of things. 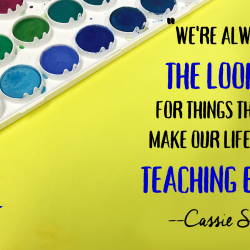 Do you think that you can get kids to honestly take ownership of the art room, and caring for the art room? Or is that always gonna be something that needs to be influenced by the teacher? And, I guess, if you do think that you can get kids to take ownership, what are some of the strategy you use to get them to that point? Tim: Yes, and just to add one thing to that. I think with older kids, especially with my high schoolers, you can encourage them, and kind of coach them to take leadership roles in that too. Just calling kids out if they see them not putting things away. Like, “Hey, these are the only supplies we have. Make sure you get your crap done. Do what you’re supposed to do.” And I think if you can kind of empower kids to take responsibility for those things. Then I think it can make a huge difference in your room, and it makes your life so much easier if you can get your kids kind of taking the lead on some of that stuff. But one last question for you, let’s get people out of here with some actionable items. What can people do to get kids to quit trashing the art room? What would be your top three tips that help you keep the room clean? Abby: Number one, give your students responsibility with materials. That would be the first one. I would assign materials. Like, we talked about the paintbrushes. 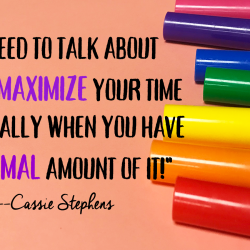 Obviously, you can’t do that with everything, but kind of some of those maybe tricky areas that you seem to always be having to replace, or take care of more. Maybe, start with those materials first. And lastly, I know that I’m not always the best at this, but be a good example yourself. Put things away. If you want your students to do that. We all know that actions speak louder than words. You have to be a good example for your students. Tim: Yeah, that’s awesome. And I think I agree with those. I’m gonna add just one more. I think labels are the biggest help. If you can label here is where glue goes. Here is where erasers go. Here is where pencils need to be put away. That’s such a huge help for kids. Just because then they’re not confused. They’re not walking around, wandering around, like, “I don’t know where to put the markers.” There’s a giant cabinet that says markers on it. Send them over there. And, yeah, it’s gonna make your life a lot easier. Abby: One last thing that I just remembered, I recently just got a peg board. Like, a big metal one, drilled into my wall, kind of for everyday items that we use all the time, and that’s been a life saver. If you can get one of those, do it. It really, really seems to help. Tim: I love it. What kind of stuff do you have on there? Abby: I have my pencils that I have feathers taped onto, that the students, those are just the ones that they can take. Scissors. I have glue sticks, which we don’t really use that much. I don’t know why I have them in there. Glue sticks, but kind of our black Sharpies go there. Our colorful Sharpies, and then our crappy colored pencils. I keep the Prismacolors put away, but then kind of the waxier colored pencils, just kind of for everyday use, if they just need to brainstorm something in their sketchbook. Those kind of materials are there, and it’s really easy for kids to access them, ’cause it’s kind of the main point where they’re at. Kind of the everyday materials there, so, that helps out a lot. Tim: Yeah, that’s awesome advice. Good idea, and probably a good last bit of help for people before we get out of here. Abby, we’ll wrap it up there. Thank you so much for joining me, and best wishes on getting your room clean. Abby: I’ll do my best, thanks. Tim: As Abby said she thrives in organized chaos. That’s never gonna be me. But I will say that no matter the situation, and no matter how much of a mess you can deal with, you’re probably going to be a little bit better off, and your kids are going to better off, if you can get things a little more clean, a little more organized. I hope some of the tips we talked about here can help you in that regard. And before we go, I want to remind you again about Art Ed PRO. Like I said earlier, Abby and I, have both filmed some new learning packs for PRO that will be out in the fall, and it’s always a great experience. I told you last week too about how a lot of teachers are getting PRO subscriptions paid for by their schools. There’s PD money out there. Your administrators know how to access it, and some of them are actually buying subscriptions for their teachers instead of textbooks. And seriously, PRO is going to so much more valuable than those textbooks that are just gonna sit on your shelf, and not get used. Districts all over the country are finally realizing this, and hopefully yours can get on board as well. If you have an admin that you want to talk to, you want to look into getting a subscription, they can check it out at theartofed.com/proforschools. Alright, that is it for this week. Andrea Slusarksi will be back on the show next week to try to convince me that water color painting, and teaching watercolors is actually enjoyable. It’s going to be a tough sell, but hopefully an enjoyable episode. That’ll be out next Tuesday, but until then use what we talked about today, and go teach your kids how to not trash your art room. 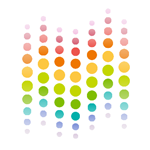 Art Ed Radio is produced by The Art of Education, with audio engineering from Michael Crocker. Our email list has exploded over the past few weeks, with all kinds of new people signing up. They obviously want my witty opinions, and my sardonic humor in their inbox every single week. If you want to get in on that as well, make sure you go sign up at artedradio.com. Thanks for listening, and we will talk to you next week.